Mario is a chef and Yoshi is his hungry helper in this puzzle game by Bulletproof Software. Clear all of the cookies by scrolling rows or columns horizontally or vertically, making a line of one kind of cookie so Yoshi can gobble them up. 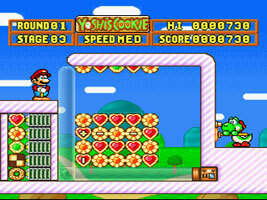 The SNES version, released a little later, contains the same play modes as the NES and Game Boy games, but also features a Puzzle mode where you have to clear the cookies from the screen within a certain number of moves. You can also play the VS Mode against the computer.